Are you working in the right industry to make the most out of your chemical engineering degree? Ever wonder if other chemical engineers with the same experience level get paid more than you? If you'd like statistics that can help you answer these questions, you'll definitely want to check out the results of AIChE’s biennial salary survey. You'll learn which industry pays the most, how your salary stacks up to your peers, and the difference in salary between genders. The graphic below shares some basic findings from this year's survey, and following, we share a bit more detail and explanation. But you can also expect more information to come in future posts over the next few weeks. The median annual salary of survey respondents working full-time is $124,000, which is 2.4% lower than the median of $127,000 reported in 2015. In comparison, the previous salary survey reported a 5.8% increase in median salary between 2013 and 2015. 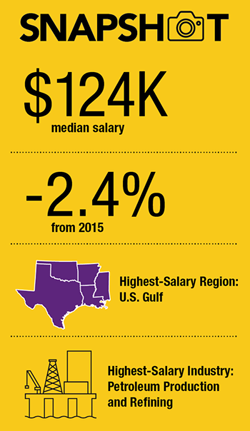 The decrease in median salary was unexpected. A factor contributing to the decline may be that this year’s survey was conducted by a different research and analysis firm. In taking a fresh look at the data and methodology, they identified several procedural changes that could improve the accuracy and reliability of the report. We feel that this year’s data provide a better baseline for future comparisons. Median salaries ranged from $70,450 for chemical engineers with fewer than three years of experience to $156,000 for those with more than 40 years in the workforce. Numerous other factors — including age, gender, education, job function, and industry — were also examined for their impact on chemical engineers’ paychecks. You can also share you opinion and talk about findings with others in a lively discussion on Engage.